Mummy and Daddy had a tough job trying to source that perfect mug of milk for little J. They looked here, there and everywhere. They tried this, that and the other. They even thought of buying their own cow! Try as they might, nothing passed J's exacting standards when it came to his evening cup of milk. Then one day, just as Mummy was getting really desperate trying to get J to drink milk, her i-phone beeped. There was a message doing the rounds on Whatsapp about drinking delicious milk, and the name 'Cravendale' popped up. Mummy was intrigued. She went out to buy a blue-topped (for that was what J liked to drink) 2 litre bottle of Cravendale milk. She wasn't sure if J would approve, but having tried everything else, she was willing to give it a go. That night, as J and Daddy sat down to read bedtime stories, Mummy filled three special mugs with Cravendale milk. There was Daddy's mug, which was a Father's Day present from J and had lovely photos of them together. Then there was Mummy's special mug - her first Mother's Day present from the then baby J. And of course, J's very own hand-painted favourite mug. Mummy made sure the Cravendale milk was at just the right temperature. Not too hot and not too cold. She placed the mugs on her best pink and blue tray. Then she took up the milk to where J and Daddy sat reading books. J, good little thing that he was, took his milk mug in his little hands. For he did love drinking milk, really. It was just that it had to be just so! Mummy held her breath as he looked at the milk. It looked creamy and white and delicious. J leaned in and took a sip. And then something happened. Something that had never happened before. Instead of letting out an ear-curdling wail about how he didn't like this milk, little J smiled. "I like this milk," he said. "It tastes yummy!" Mummy and Daddy heaved a huge sigh of relief. At last, with Cravendale, they had found the milk that came up to J's exacting standards. Mummy took her mug and Daddy took his. They all huddled together under a blanket and between delicious sips of milk, began reading J's favourite book of stories. 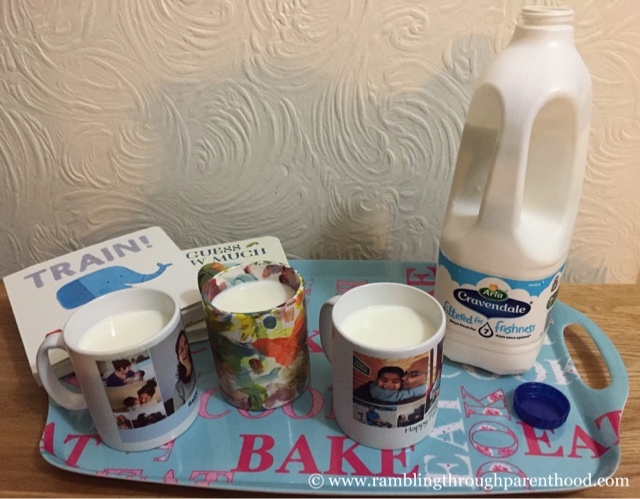 Disclosure: This post is an entry for BritMums #MilkDrinkersMilk Linky Challenge, sponsored by Cravendale.